We should note that this is not actually the new Sodo arena, with which Seattle hopes to lure an NBA franchise; this is only a model. And not a strictly accurate one—unless I misunderstand the load-bearing properties of butter, I do not believe the inside is hollow and contains a little butter court with little butter baskets, ringed by little butter luxury suites, one of which contains little butter Maloofs. Also, no one knows what the actual arena will look like yet, so the butter people make it look like half a basketball, which is evidently what butter people think NBA arenas should be. The latest on the arena front is that Seattle signed off on financing last week, but it's still far from a done deal. First there'll be an environmental review. Then the inevitable lawsuits from groups opposed to the Sodo arena, including the Mariners and local industrial unions. Then the city council gets to back out if it wants to. And then Chris Hansen has to lure a team before construction can begin. 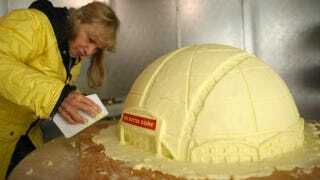 Until then, behold the Butterdome.